The Intrepid's new Enterprise exhibition displays space shuttle instrumentation that was once part of Enterprise, or another prototype shuttle, according to NASA. NEW YORK — A floating Manhattan museum unveiled a temporary new exhibition devoted to the space shuttle Enterprise today (Jan. 17) while the prototype orbiter — NASA's first shuttle — is being restored after a devastating storm. Called "Space Shuttle Enterprise: A Pioneer," the exhibition debuted inside the Intrepid Sea, Air and Space Museum in response to the closure of the Enterprise pavilion after Hurricane Sandy, displays some never-before-seen artifacts from the space shuttle's history. The shuttle Enterprise itself is parked on the flight deck of the Intrepid, which is a retired World War II aircraft carrier. "The exhibition is really looking at Enterprise, celebrating its history," Jessica Williams, curator of history at the museum said. "We'll be getting a little bit of background about the science of the space shuttle and the origin of the space shuttle program, but focusing on Enterprise specifically, what Enterprise accomplished. Also, we're taking a peek at some of the people involved with Enterprise and the pop culture connections as well." The space shuttle Enterprise was NASA's first space shuttle, but never flew in space. The prototype orbiter was used for vital approach and landing tests that paved the way for the first orbital shuttle flight in 1981. The Enterprise was named after the fictional "Star Trek" starship of the same name in 1976 after a massive letter-writing campaign to the White House. Although they aren't the originals that flew aboard the Enterprise, NASA donated some cockpit instruments that were in use during the time the shuttle Enterprise flew in 1977. 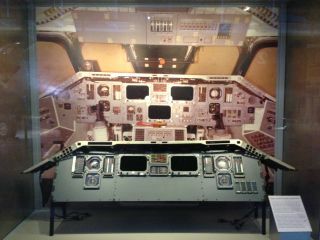 Because visitors to the Intrepid cannot see the interior of the space shuttle, the instruments and accompanying photo of Enterprise's control panels are a good alternative, Williams added. "During the time the pavilion was closed, we were fully aware that the public was still eager to hear stories and see material object related to the shuttle," Elaine Charnov, vice president of exhibits told SPACE.com, "so obviously this is just another opportunity to provide the public with additional stories and content." The space shuttle arrived in New York and was delivered by barge to the Intrepid in July 2012. Enterprise was damaged during Hurricane Sandy when the museum lost back up electricity due to high winds. The inflatable pavilion housing the space shuttle deflated, detaching part of the shuttle's vertical stabilizer. The pavilion has been closed ever since, but it should be up and running again sometime in the spring, a museum spokesperson said. While the Intrepid has no set plans to take down the exhibit anytime in the near future, the temporary exhibit was created on an incredibly accelerated time scale. "This was probably about one-eighth of the design, development, building process that we normally would have," said Christopher Malanson, the assistant vice president of exhibits at the Intrepid. Exhibition curators are still on the lookout for new materials to add to the Enterprise display. They hope any members of the public with materials related to the Enterprise will contact the museum if they wish to donate. The museum is also hoping the public will get involved in another way. A flat screen TV outside of the exhibition cycles through photos of Enterprise's arrival in New York, and the curators hope that everyone will send photos to the museum once an email address to receive crowd-sourced submissions is set up next week. Anything related to the Enterprise is welcome, Williams said. The Intrepid Sea, Air and Space Museum is located at Pier 86 (46th Street and 12th Avenue) in Manhattan. Any inquiries about donations or artifacts should be sent to: collections@intrepidmuseum.org.